Shock Top, A-B InBev's craft-like offering, has released a teaser of its upcoming Super Bowl debut. 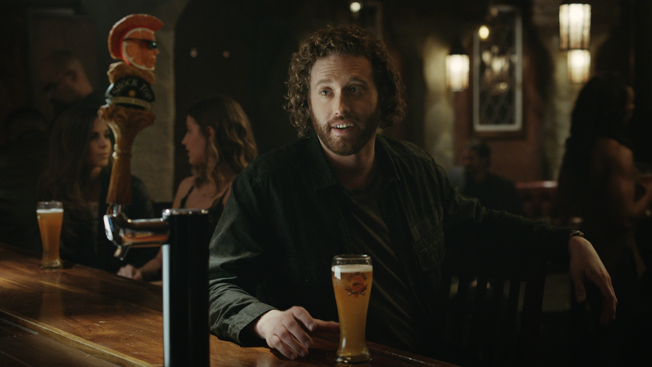 Created by Anomaly in Toronto, the 90-second clip features the brand's new spokesman, comedian T.J. Miller, who sardonically introduces himself and the beer to consumers. While it launched in 2006 and initially experienced vast growth, doubling year over year, according to the brand's vp Jake Kirsch, Shock Top has struggled to maintain that growth. "The reality is that we haven't grown as much in the last few years," Kirsch said. "The biggest piece of that challenge is that while we're available, the majority of people don't know who we are. And it's awfully hard, even if you're available, to get people to try you if they don't know you." That's where the Super Bowl comes in. "If we're going to relaunch, reignite, restage … it's about how do we reach as many people as possible and get known and filter through that clutter? And the Super Bowl is a great platform to do that with," Kirsch said. Miller, who stars in the HBO series Silicon Valley as well as the upcoming Deadpool movie, joins comedian Martin Montana, who voices the brand's mascot, Wedgehead, and will be featured in much of the brand's creative work this year. The teaser dialogue between the two comedians was ad-libbed, according to Kirsch. "T.J. Miller embodies the brand, the irreverence, the wit," said Kirsch. "We tell people to 'Live Life Unfiltered,' we're an unfiltered beer, and T.J. is at the top of the list of people like that." A-B InBev hasn't finalized placement of each of its Super Bowl spots, so it's unclear when the ad will air during the game. For more Super Bowl 50 news, check out Adweek's Super Bowl Ad Tracker, an up-to-date list of the brands running Super Bowl spots and the agencies involved in creating them.